A major target autoantigen in anti-neutrophil cytoplasmic antibody–associated vasculitis is myeloperoxidase (MPO). Although MPO-specific CD4+ Th cells seem to orchestrate renal injury, the role of the Th17 subset is unknown. We hypothesized that Th17 cells direct injurious anti-MPO autoimmunity in experimental murine anti-MPO–induced glomerulonephritis (GN). We immunized mice with MPO to establish autoimmunity, resulting in systemic IL-17A production with MPO-specific dermal delayed-type hypersensitivity. We triggered disease using antibodies to the glomerular basement membrane to induce glomerular deposition of MPO by neutrophils. Wild-type mice developed necrotizing GN with an influx of glomerular leukocytes and albuminuria. In contrast, mice deficient in the key Th17 effector cytokine IL-17A were nearly completely protected. The protective effects resulted partly from reduced neutrophil recruitment, which led to less disposition of glomerular MPO. To test whether IL-17A also drives autoimmune delayed-type hypersensitivity in the kidney, we injected MPO into the kidneys of MPO-sensitized mice. IL-17A deficiency reduced accumulation of renal macrophages and renal CCL5 mRNA expression. In conclusion, IL-17A contributes to the pathophysiology of autoimmune anti-MPO GN, suggesting that it may be a viable therapeutic target for this disease. Among the characteristic Th17 effector cytokines, IL-17A is the most potent cytokine in inducing tissue injury.12 Several lines of evidence suggested that IL-17A may be an important mediator of ANCA-associated disease. IL-17A supports neutrophil mobilization, recruitment, and activation from the bone marrow.13,14 IL-17A stimulates resident tissue cells to produce neutrophil-attracting chemokines.15 IL-17A is chemotactic for monocytes/macrophages acting directly through ligation to its receptors expressed on monocytes.16 IL-17A induces the release of proinflammatory mediators (e.g., TNF, IL-1β) from macrophages,17 and humans with ANCA-associated disease have higher proportions of peripheral blood Th17 cells compared with controls.18 IL-17A therefore mediates both innate and adaptive immunity as a key regulator and initiator of inflammation. IL-17A not only defines the Th17 subset but also is a logical therapeutic target in diseases directed by a Th17-dominant autoimmune response. MPO-immunized WT mice developed humoral autoimmunity to MPO, measured by anti-MPO ANCA titers (OVA immunized control mice did not develop autoantibodies). IL-17A deficiency did not alter autoantibody titer (Figure 1A). Analysis of MPO-stimulated splenocyte responses showed that, compared with OVA-immunized mice, MPO-immunized mice produced significant amounts of IL-17A (but IL-17A−/− mice did not; Figure 1B) and no significant IFN-γ production was observed (Figure 1C). MPO-specific dermal footpad delayed-type hypersensitivity (DTH) was demonstrated in MPO-immunized WT mice and was absent in IL-17A−/− mice (Figure 1D). These results support a Th17-predominant autoimmune anti-MPO response. Immunization with nmMPO induces comparable levels of anti-nmMPO IgG in WT (n = 6) and IL-17A−/− mice (n = 6). (A) Levels of anti-nmMPO antibody titers in OVA-immunized mice (n = 5) are similar to normal mouse serum (0.059 OD 450 nm). (B) Re-stimulation of splenocytes with MPO induces IL-17A production in MPO-immunized WT mice but not in OVA-immunized mice. As expected, no IL-17A was detected in IL-17A−/− mice. (C) No significantly different IFN-γ production could be detected between groups. (D) Antigen-specific dermal footpad DTH responses were observed in MPO-immunized WT mice and absent in IL-17A−/− mice and OVA-immunized MPO-challenged control mice. ***P < 0.001 versus MPO-immunized IL-17A−/− and OVA-immunized WT controls. Endogenous IL-17A plays a pathogenetic role in renal injury: IL-17A−/− mice were substantially protected from renal disease. MPO-immunized WT mice developed significant glomerular disease with abnormal glomeruli (Figure 2A), fibrin deposition (Figure 2, B, E, and F), and cellular proliferation (Figure 2C). Interstitial injury was also apparent in MPO-immunized WT mice with protein casts and tubulointerstitial damage (data not shown). GN was markedly attenuated in IL-17A−/− mice (Figure 2, G and H), in which injury was similar to OVA-immunized control mice (Figure 2, I and J). Histologic injury in MPO-immunized WT mice was associated with functional damage, measured by pathologic albuminuria (Figure 2D). Analyses of cellular effectors of kidney damage were consistent with differences in structural and functional lesions. Glomerular infiltration of CD4+ T cells, macrophages, and neutrophils was more prominent in MPO-immunized WT mice compared with MPO-immunized IL-17A−/− animals, which showed levels comparable to OVA control animals (Figure 3, A through C and H through K). The observation that OVA-immunized mice did not show an accumulation of either macrophages or neutrophils confirms that both leukocyte populations are recruited by MPO-specific CD4+ Th17 cells during antigen-specific adaptive immunity and not as a result of the anti-GBM antibody. Renal injury occurred in mice with autoimmune anti-MPO focal necrotizing GN. (A through D) MPO-immunized WT mice (n = 6) showed significant glomerular injury with pronounced presence of abnormal glomeruli (A), fibrin deposition (B), glomerular hypercellularity (C), and elevated albuminuria (baseline levels of albuminuria from naive WT mice being 0.13 mg/24 h; D). Protection from glomerular injury was observed in IL-17A−/− mice (n = 6), and renal injury was similar to OVA-immunized control mice (n = 5). (E through J) Illustrative examples of periodic acid-Schiff and fibrin staining between groups of mice shown, respectively; MPO-immunized WT mice (E and F), MPO-immunized IL-17A−/− mice (G and H), and OVA-immunized WT mice (I and J). *P < 0.05, **P < 0.01, ***P < 0.001 versus MPO-immunized IL-17A−/− and OVA-immunized WT controls. Cellular effectors of injury accumulate in WT and IL-17A−/− mice. (A through C) MPO-immunized WT mice (n = 6) with autoimmune anti-MPO GN showed significantly higher numbers of renal CD4+ T cells (A), macrophages (B), and neutrophils (C) when compared with OVA-immunized mice (n = 5). Accumulation of these cells was largely IL-17A dependent. (D, F, H, and J) In WT mice, triple staining for MPO (F, green) neutrophils (H, blue), and macrophages (J, red) showed that some of the MPO molecules co-localized with neutrophils (vertical arrows, D), whereas some were associated with neither neutrophils nor macrophages (horizontal arrow, D). (G, I, and K) In the absence of IL-17A, the autoantigen, MPO was markedly diminished in glomeruli (G), as were glomerular neutrophils (I) and macrophages (K). (E) The overlay. **P < 0.01, ***P < 0.001 versus MPO-immunized IL-17A−/− and OVA-immunized WT controls. The reduced glomerular injury observed in IL-17A−/− mice in this model results from reduction in effector pathways dependent on IL-17A. As is likely in human disease, neutrophil activation and recruitment to the kidney is an important mechanism of tissue damage.19 MPO itself is injurious,20 but it can also act as a planted autoantigen when deposited in glomeruli and recognized by effector T cells. Figure 3D shows the presence of free MPO (horizontal arrow) and its association with neutrophils (vertical arrows), data consistent with our previous findings in a similar model.5 Fewer neutrophils and therefore less auto-antigenic MPO molecules are present in glomeruli of IL-17A−/− mice (Figure 3, C and F through I), consistent with IL-17A playing an important role in neutrophil trafficking to sites of tissue injury. To study the role of IL-17A in neutrophil accumulation in the absence of an active immune response, we injected anti-GBM antibodies into naive WT and IL-17A−/− mice and studied glomerular neutrophil accumulation at the time of peak influx, 2 hours.21 Neutrophil influx triggered by anti-GBM antibody injection was significantly reduced in IL-17A−/− mice (Figure 4A through C). The cellular origin of IL-17A in this experiment was not studied further. It is possible, however, that leukocyte subsets different from Th17 cells are involved, because rapid induction of IL-17A production has been shown for γδ T cells,22 invariant NKT cells,23 and natural Th17 cells.24 Regardless of the cellular source, one mechanism by which IL-17A deficiency confers protection in experimental autoimmune anti-MPO GN is by reducing renal neutrophil influx. Thus, diminishing direct neutrophil induced injury and the release and deposition of injurious MPO, resulting in diminished DTH effector responses. IL-17A is important in localizing both neutrophils and macrophages to the kidney in experimental anti-MPO disease. After injection of anti-GBM antibodies to naive WT and IL-17A−/− mice (n = 6), neutrophils accumulated within glomeruli by 2 hours. (A through C) This neutrophil accumulation was diminished in the absence of IL-17A. ***P < 0.001 versus IL-17A−/− mice. (D) Intrarenal injection of MPO to MPO-immunized mice (n = 7) results in macrophage accumulation in the kidney, which is abrogated in the absence of IL-17A (n = 6). *P < 0.05 versus MPO-immunized, MPO-injected 1L-17A−/− mice and OVA-injected WT mice. (E) Reductions in numbers of CD4+ cells are NS. 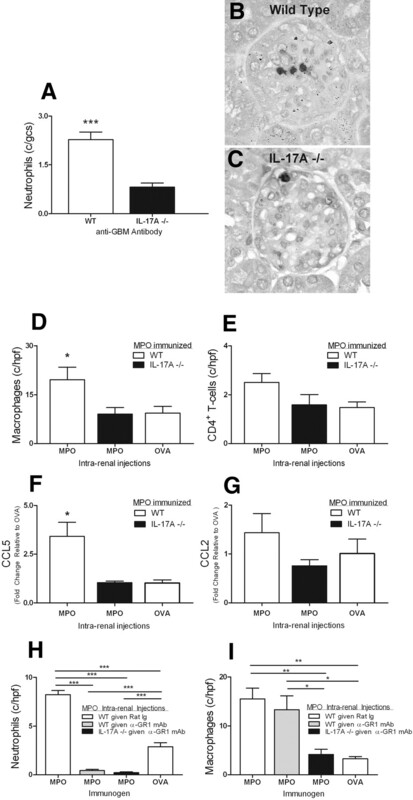 (F and G) IL-17A deficiency is associated with significantly reduced renal mRNA expression of CCL5 and a trend toward lower CCL2 expression in MPO-injected kidneys relative to MPO-immunized WT mice that were administered an intrarenal injection of OVA. (H) Neutrophil depletion before intrarenal injection of MPO in MPO-immunized WT and IL-17A−/− mice (n = 6) resulted in >90% depletion in kidneys. ***P < 0.001. Treatment did not alter macrophage recruitment compared with nontreated MPO-immunized, MPO intrarenally WT mice (n = 6). Macrophage recruitment was significantly reduced in kidneys of IL-17A−/− mice. *P < 0.05; **P < 0.01. Th17 cells and IL-17A also recruit and activate macrophages. We hypothesized that in mice with IL-17A deficiency (and therefore mice that are also deficient in Th17 responses), autoantigen (MPO)-induced Th17-directed macrophage accumulation in kidneys would also be reduced. To bypass the requirement for IL-17A in neutrophil recruitment and thus MPO deposition in the kidney, we injected MPO intrarenally into the interstitium of MPO-immunized mice to initiate a DTH effector response in the kidney. We previously established and published the technique of direct intrarenal injection to study the induction of T cell responses in response to a planted foreign antigen.25 Hence, MPO was directly injected into the interstitium of MPO-immunized WT and IL-17A−/− mice. Genetically intact MPO-immunized and MPO-injected mice developed an interstitial infiltrate of CD4+ cells and macrophages (Figure 4D). Absolute numbers of CD4+ T cells were not significantly different between the groups (Figure 4E), but macrophage recruitment was reduced in IL-17A−/− mice and similar to MPO-immunized WT mice intrarenally injected with OVA. This observation is consistent with a role for IL-17A produced by infiltrating antigen-specific T cells in promoting macrophage recruitment. Furthermore, the data obtained from intrarenal injections are in agreement with the reduced MPO-specific dermal DTH observed in IL-17A−/− mice. The mechanisms by which IL-17A directs monocytes/macrophages to the target organ are likely to involve both direct induction of chemotaxis by IL-17R ligation and the induction of intrarenal chemokine expression. The monocyte-attracting chemokine CCL5 was significantly reduced in kidneys of IL-17A−/− mice, whereas reductions in CCL2 did not reach statistical significance (Figure 4, F and G). To extend this study further, we performed a separate experiment in which neutrophils were depleted before intrarenal injections. Thus, any influence of possible differences in endogenous MPO or neutrophils between the mouse strains on renal DTH responses could be eliminated. Treatment resulted in almost complete absence of neutrophils in kidneys after intrarenal MPO injection (Figure 4H). As in the first set of experiments, macrophage recruitment was significantly impaired in IL-17A−/− mice. Importantly, macrophage numbers were not affected by neutrophil depletion in WT mice, showing that macrophages have not been affected by neutrophil depletion and arguing against dependence on endogenous MPO for macrophage infiltration (Figure 4I). Collectively, these observations show that IL-17A promotes autoimmune anti-MPO renal injury via effector cell recruitment in response to MPO as a planted antigen. In conclusion, these studies provide the first support for a functional role for Th17 responses in ANCA-associated disease. The prominence of neutrophils in this disease, as well as its autoimmune pathogenesis, suggests that the Th17 subset is injurious. IL-17A plays pathogenic roles in experimental autoimmune anti-MPO focal necrotizing GN in two ways. The first mechanism involves its effects on mobilizing and directing neutrophils. These neutrophils localize to vulnerable vascular beds, including the glomerulus, where they release MPO, which is important both for inducing injury itself and as a planted autoantigen. 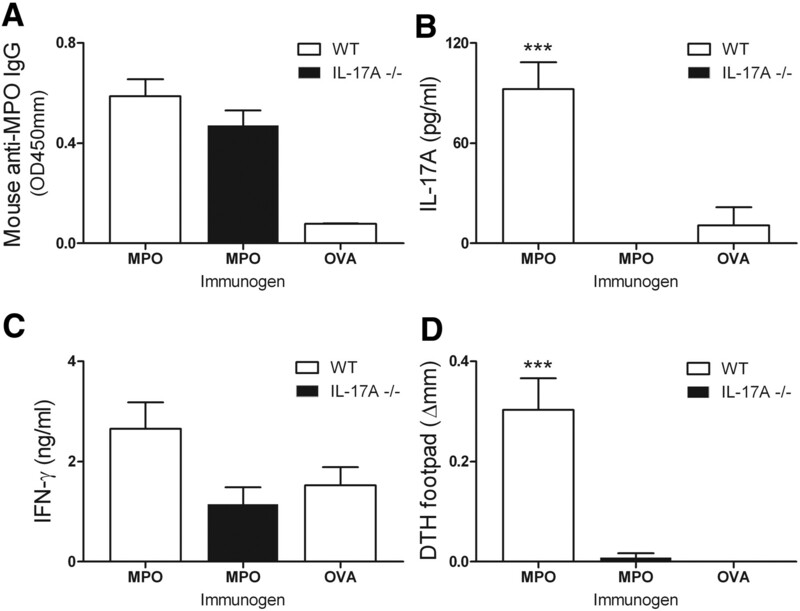 The second mechanism by which IL-17A is important is via promoting recruitment of injurious effector macrophages to the target organ in a DTH-like manner in response to MPO as an autoantigen. Because both mechanisms are relevant to human ANCA-associated diseases, IL-17A may be a promising therapeutic target in these conditions. All mice were on a C57BL/6 background. WT mice and IL-17A−/− mice26 both were bred at Monash Medical Centre (Melbourne, Australia), and experiments were approved by the Monash Medical Centre Animal Ethics Committee B. Eight- to 10-week-old male mice were used to induce anti-MPO focal necrotizing GN. WT and IL-17A−/− mice were immunized on day 0 with 20 μg of native mouse MPO (nmMPO) in Freund's Complete Adjuvant (Sigma-Aldrich, St. Louis, MO) intraperitoneally. On day 7, mice received a booster injection of 10 μg of nmMPO in Freund's Incomplete Adjuvant (Sigma-Aldrich). nmMPO was purified from differentiated 32Dcl3 cells as described previously.27 On day 16, mice were administered an intravenous injection of 1 mg of sheep anti-mouse GBM globulin and humanely killed after an additional 4 days.5 To assess neutrophil recruitment in responses to anti-GBM globulin, we administered an intravenous injection of 4 mg of sheep anti-mouse GBM globulin to WT and IL-17A−/− mice and killed them humanely 2 hours later, at the time of maximal neutrophil influx. To assess intrarenal responses to nmMPO as a planted antigen, we planted 10 μg of MPO or OVA in vivo into the inferior pole of the kidney cortex of mice with established autoimmunity against nmMPO on day 14 as described previously.25 Kidneys were harvested 36 hours after injection. Tissue in the immediate vicinity of the injection site and the superior pole of the kidney were discarded, and the middle section was kept for histology and mRNA analysis. Renal interstitium was scored by counting positive cells in a minimum of 25 high-power fields (hpf), and results were expressed as cells per hpf. Statistical analysis was carried out by ANOVA with post hoc analysis by Tukey test. For experiments with only two groups, we applied the unpaired t test (GraphPad Prism; GraphPad Software, San Diego, CA). To assess the role of endogenous MPO on the intensity of kidney DTH responses, we immunized mice with nmMPO or OVA as described already. Neutrophils were depleted in mice by intraperitoneal injection of 200 μg of anti-GR-1 mAb (RB6–8C5; DNAX, Palo Alto, CA) or rat Ig for controls 24 hours before and after intrarenal injections. Efficient depletion (>90%) was confirmed in kidneys by counting of stained neutrophils. Kidneys were fixed with Bouin's fixative and embedded in paraffin, and 3-μm-thick sections were stained with periodic acid-Schiff reagent. Glomerular pathology was assessed in 40 glomeruli per mouse and scored for abnormalities according to a method previously published.28 Abnormalities included crescent formation, necrosis, segmental proliferation, and capillary wall thickening. Fibrin staining was performed on paraffin-cut sections using rabbit anti-mouse fibrinogen (R-4025; a gift from Dr. J. Degen, Childrens Research Foundation, Cincinnati, OH) with an ABC kit (DakoCytomation, Glostrup, Denmark) using diaminobenzidine (Sigma-Aldrich) as a substrate.29 A minimum of 40 glomeruli per mouse was scored, and results were expressed as percentage of glomeruli with fibrin deposition. Glomerular leukocytes were assessed on immunoperoxidase-stained periodate lysine paraformaldehyde (PLP)-frozen 6-μm cryostat-cut kidney sections using a three-layer immunoperoxidase technique as described previously.30 The primary mAbs used were RB6–8C5 for neutrophils (anti-GR-1; DNAX, Palo Alto, CA), FA/11 for macrophages (anti-mouse CD68; provided by Dr. G Koch, MRC Laboratory of Molecular Biology, Cambridge, England), and GK1.5 for CD4+ T cells (anti-CD4; American Type Culture Collection, Manassas, VA). A minimum of 40 glomeruli per mouse was scored, and results were expressed as positive cells per glomerular cross-section. Deposition of MPO and co-localization with neutrophils and macrophages in glomerular lesions was assessed using PLP-frozen 6-μm cut sections, blocked with 10% rat serum in 5% BSA/PBS before primary antibodies were applied; 100 μg/ml FITC-conjugated rabbit anti-mouse MPO polyclonal antibody (Thermo Fisher Scientific, Fremont, CA), 20 μg/ml Alexa 568–conjugated FA/11 and 20 μg/ml Alexa 647–conjugated RB6-8C5 in 1% BSA/PBS. For assessment of neutrophil depletion, PLP-frozen 6-μm cut kidney sections were stained with 4 μg/ml PE-labeled Ly6G antibody (IA8; BD Pharmingen) as described already. Confocal images were captured using a NikonC1 inverted confocal laser scanning microscope and acquired using line sequential scanning. For quantification of intrarenal chemokine expression, CCL2 and CCL5 mRNA was measured by real-time PCR performed on a Rotor Gene RG-3000 (Corbett Research, Mortlake, Australia) using FastStart DNA master, Sybr Green I (Roche). Expression of the housekeeping gene 18s was used as internal standard to correct for variation of mRNA amounts between experimental samples. Results are expressed as fold change relative to MPO-immunized control mice that were administered an intrarenal injection of OVA. Primer sequences are available on request. Circulating anti-mouse MPO IgG titers in sera were measured by ELISA using 100 μl/well 1 μg MPO and horseradish peroxidase–conjugated sheep anti-mouse IgG (1:1000; Amersham Biosciences, Rydalmere, Australia).31 For detection of dermal DTH to MPO, mice were challenged with 3 μg of nmMPO in 40 μl of saline in the right hind footpad 24 hours before the termination of experiment, and the left hind footpad received saline. DTH was assessed upon culling of mice and quantified by measuring the difference between footpad thickness (Δmm) using a micrometer. For splenocyte cytokine production, spleens were removed aseptically from experimental mice and single-cell suspensions (4 × 106 cells/ml per well) were cultured in RPMI/10% FCS with 2 μg/ml MPO for 72 hours. Concentrations of IFN-γ and IL-17A were measured by ELISA.32 For IFN-γ, the mAbs were rat anti-mouse IFN-γ (R4–6A2; BD Pharmingen) and biotinylated rat anti-mouse IFN-γ (XMG1.2; BD Pharmingen). IL-17A was measured using paired antibodies (DuoSet; eBioscience, San Diego, CA). These studies were supported by a program grant from the National Health and Medical Research Council of Australia. See related editorial, “IL-17A in Experimental Glomerulonephritis: Where Does It Come From?” on pages 885–886.